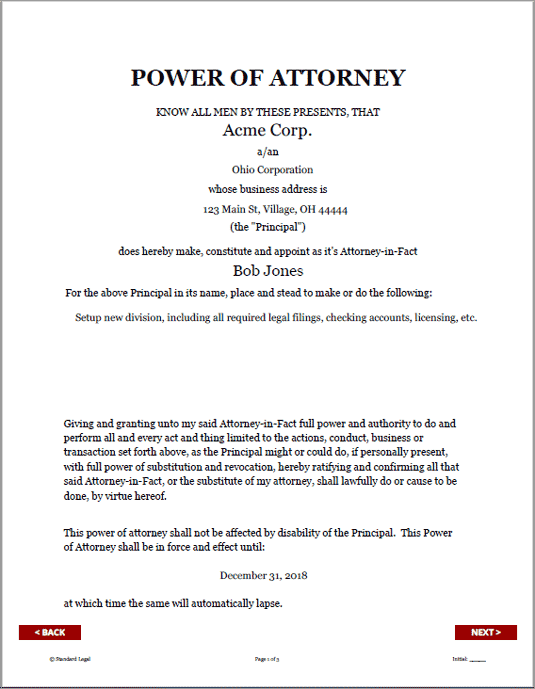 Designate power of attorney to handle specific legal or administrative functions on behalf of a business entity. 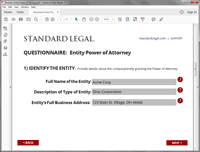 An Entity Power of Attorney is required if an action must be completed on behalf of a Corporation, LLC or Partnership, but a Member or Director of the entity is not personally available to do so. 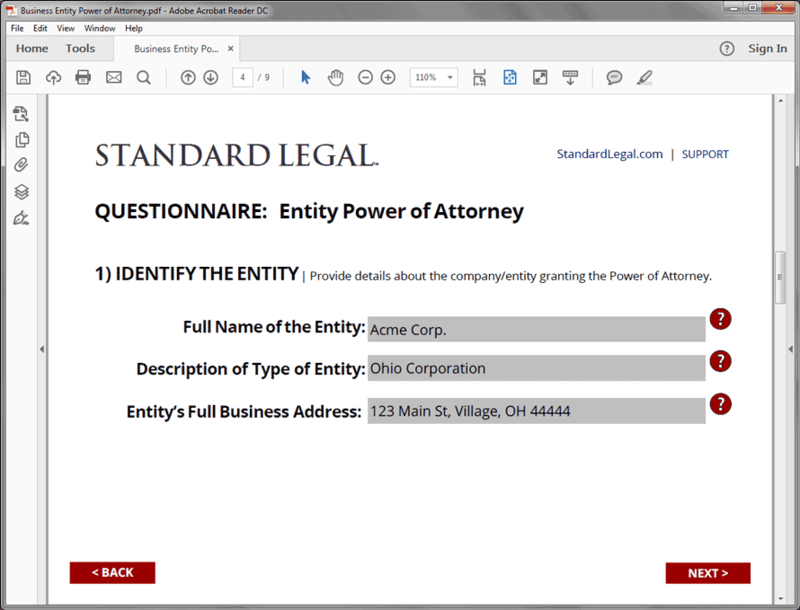 Create a Business Entity Power of Attorney document in minutes with easy-to-use software from Standard Legal! 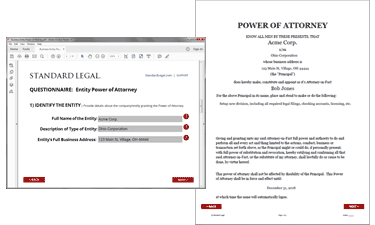 The Entity Power of Attorney legal form software title was created to permit an entity, such as a Corporation, a Limited Liability Company, or a Partnership (which would be the "Principal"), to authorize an individual or another company (who would be the "Attorney-in-Fact") to conduct business on behalf of the entity. For example, the Principal can appoint the Attorney-in-Fact: to buy, sell or transfer property; to sign agreements; to purchase assets; to open or close a bank account; to buy or sell stocks; to handle imports or exports, etc. The authority granted under this document is limited to the tasks, business or transactions specifically stated in the document. 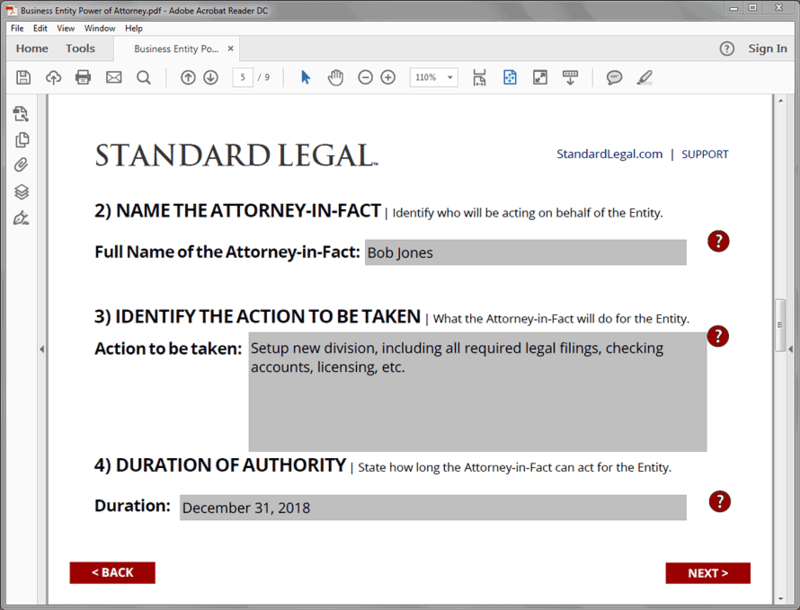 Also, the authority granted can be limited in time, meaning that if the action or business is not taken by the date set forth in the document, the authority of the Attorney-in-Fact ends. 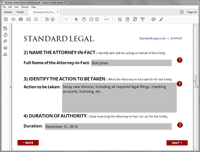 Executing and delivering a power of attorney document by or from an entity may require that the entity secure shareholder, member, partner, manager, officer or director approval in advance. Such approval may depend on the scope or type of authority to be granted to or the tasks to be performed by the Attorney-in-Fact. The entity formation documents (i.e. articles or incorporation, articles of organization, partnership agreement, etc.) or code of regulations/bylaws or operating agreement may dictate what actions require owner, manager, director or officer approval. 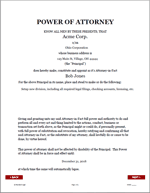 The Principal should carefully examine these entity documents to determine whether authority exists for the issuance of a power of attorney document and/or what approvals must be obtained prior to issuing a signed power of attorney document, if any.